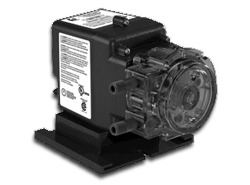 Stenner's adjustable metering pump is built with three detachable components: the motor, feed rate control, and pump head. 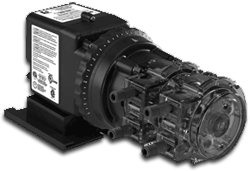 Outputs are dependent upon three factors: the rpm of the motor gears, the percentage setting on the feed rate control, and the size of the peristaltic pump tube. 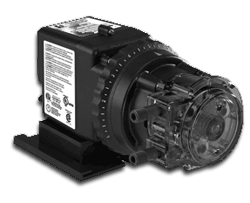 All Stenner metering pumps have a 3-point roller design in the pump head, which acts as a check valve to prevent back flow, siphoning, overdosing and loss of prime.